Beneteau is proud to have built a foundation of trust over its 130 years at sea. In 1998 the European Union created a Recreational Craft Directive that established design standards for most recreational boats from 8 to 79 feet. The level of detail applied to quality assurance was one of the highest I have witnessed in more than the 160 factories I have visited around the world. Introduced at Strictly Sail Miami, the Oceanis 41.1 is the new mid-size cruiser everyone has been talking about! As Volvo Penta celebrates 10 years of its revolutionary Inboard Performance System (IPS), the company takes a look back at some of the system's earliest adopters, including long-time customer Beneteau. Whatever your reasons may be for purchasing a boat, it is important you choose the right boat for you, your family and your lifestyle. What Makes Beneteau's Dealer Network so Strong? Customer satisfaction is paramount at Beneteau. It is at the forefront of absolutely everything we do. 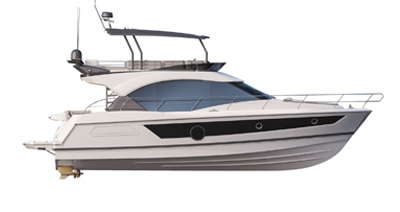 It's the speed, comfort, stability and fuel efficiency working in perfect harmony which is the real secret behind Beneteau's Swift Trawler series.